In advance of the next tax season, learn more about ways tax sites can encourage families to consider savings through refund splitting. 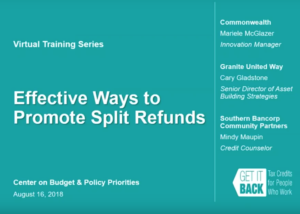 The Get It Back Campaign, a national effort to connect eligible workers to tax benefits, has posted a recording of its training on Effective Ways to Promote Split Refunds. As part of the Get it Back Virtual Training Series, this training introduced the national Save Your Refund (SYR) Contest, ways organizations can participate, and related messaging resources.